Hamilton Hill is part of the Beeliar Boodjar, the traditional lands of the Whadjuk Nyungar people, who remain the custodians of this area. Hamilton Hill is the most north-western suburb within the City of Cockburn. It is located approximately 20 kilometres south west of the Perth GPO and 5 kilometres south of Fremantle. Hamilton Hill is the largest and one of the fastest growing suburbs in Cockburn. The City of Cockburn is known to the Indigenous traditional owners of the area as Beeliar Boodjar. Beeliar are one of the clans of the Whadjuk group of Nyungar and Beeliar Nyungar means ‘river people’. Boodjar means land. ‘The Dreaming’ is a term used to describe Aboriginal creation stories about events within and beyond the living memories of Aboriginal people. The Dreaming shaped the physical, moral and spiritual world and continues to renew and sustain itself today. Nyungar responsibilities, beliefs and values have been based on the same principles. The content of Dreaming stories may change depending on the narrator, audience and location. However, the Rainbow Serpent, the Waakal is always depicted as fundamental to Nyungar Dreaming, creating the shape of the boodjar and giving foundation to the meaning of life. It is easy to look at the Beeliar wetland system and visualise this huge Waakal twisting up and down, making its way north to Fremantle and south to Mandurah. Prior to European contact the Nyungar people were hunter gatherers who moved along definite routes determined by seasonal supplies of food and water. They lived in closely knit family groups related by kinship, and over the previous centuries, they had evolved a sound social framework and a finely tuned established order. The arrival of European explorers and settlers in the Swan River Colony in the late 1820s and the movement of people into the interior of Western Australia in the subsequent decade was to set in motion a period of enormous change for the Aboriginal inhabitants of Western Australia. The arrival of the Europeans, with their different attitudes to land ownership and tenure, was to have a devastating effect upon the traditional way of life of the people. Investigation of the Cockburn region prior to European settlement in 1829 shows evidence of a large Aboriginal presence. Archaeological findings show camp sites in the vicinity of the freshwater lakes in the Cockburn Sound district, particularly near North and Bibra Lakes. Artefacts and rock engravings found in Cockburn reflect their use of the land. However, their occupation of the land became threatened with the arrival of the Europeans and since 1829 the history of Cockburn has been dominated by the development of the land under European influence. Captain George Robb bought the first plot in Hamilton Hill in 1830 and left it in the hands of a manager, Sydney Smith. By making sure it was well provisioned, the property became a viable small farm. Hamilton Hill was also the locality for the first vineyard in the Swan River Colony. The vineyard became a valuable source for root stock for other grape vines in the Colony when the owner, Charles MacFaull, decided to withdraw from the venture. MacFaull did not leave the Cockburn District. He was appointed the first Government Printer of the Swan River Colony. He bought a Ruthven type and printing press to his Hamilton Hill property and commenced printing the forerunner to the “West Australian” Newspaper – the “Fremantle Observer”, ”Perth Gazette” and “West Australian Journal”. The introduction of the convicts to the Swan River Colony was a catalyst for growth in Cockburn. The convicts supplied vital labour for the building of roads and bridges such as the improvement of the Clarence-Fremantle and Beenyup roads in the 1850s. Some people were quick to recognise the increased demand for fresh produce that resulted from the need to feed the convict population. Market gardens supplying fruit, honey, vegetables and dairy products expanded into areas adjacent to Fremantle, including Hamilton Hill. Most of Cockburn remained in large estates which used the uncleared, unfenced land for grazing sheep and cattle. In 1860 Charles Alexander Manning bought 364ha of Robb’s land and established a prosperous estate known as Davilak Estate. The name came from the Aboriginal belief that the nearby lake held evil spirits. They called it Davilak, Devil’s Lake. The Manning family resided in the district for many years and became prominent citizens of the Cockburn region. In 1866 the family built Davilak House for Charles’s son, Lucius Manning. In the 1870s land use regulations were introduced to encourage small farms and the prevention of the continuation of large scale grazing in the areas around Fremantle and Perth. Smaller selections of land were made possible under the rule of “Special Occupation Leases”. Large pastoral leases were cancelled. Immigration schemes initiated by the Government Surveyor, John Forrest, also encouraged settlement, while speculation by absentee landowners was discouraged. The resulting effect was a growing population and an expansion of land under production in areas like Hamilton Hill and Spearwood. With the growth of population in the Cockburn district the expanding need for better amenities was met by the Fremantle District Roads Board which was established in 1871. Excursions to Fremantle from Hamilton Hill were difficult as the roads were mostly unpaved, even though the Roads Board launched a much more organised program of road building. Roads were built and maintained in this era with the use of convict labour. Road building was labour intensive and the convicts were an important factor in the progress of road building in the district. Despite the loss of convict labour in 1875, in 1877 the Coogee Road (formerly Koojee) was built from Rockingham Road to Spearwood. This was one of the first roads to go through Cockburn. The condition of the roads was important to the farmers who relied on these routes to get their goods to the market. Problems often arose because of sandy and boggy tracks. Development in Cockburn between 1870-1889 was steady and the growth of market gardens and small industries paved the way for the future of the area. The people who had weathered the difficulties of settling virgin land were to reap the benefits in the future years as the West experienced its Golden Years. For a market gardening area such as Hamilton Hill, the demand for fresh produce by the thousands of miners who flocked to the goldfields during the gold rush was very beneficial. The boom in the West’s economy created pressure on land prices which rose significantly. The effects were felt in Spearwood and Hamilton Hill, where many of the large land holdings were subdivided. In 1899 large tracts of land in Hamilton Hill were subdivided. The Dixon family bought newly subdivided land in this year and by selecting good arable soil the family established a very successful market garden. The expanding population and land use brought to the district many new occupations and products. A school was opened in Hamilton Hill in 1903. In other parts of Cockburn, roads were built to link the market gardens with Fremantle. 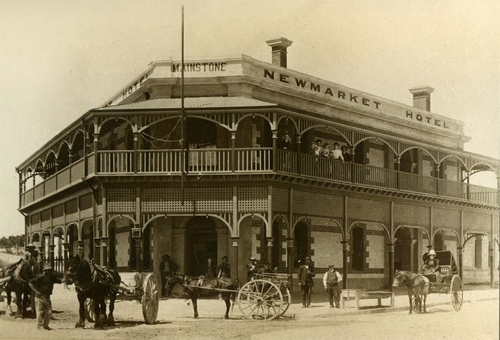 Newmarket Hotel was built in 1912 along a new limestone road to service traveller’s needs. The Manning family continue to be very influential in the district and when Azelia Ley, daughter of Lucius Manning, was married in 1905, a house was built for her. In the first four decades of the 20 Century population in Hamilton Hill increased with further subdivision of large estates. Manning Estate was split up in the pre World War I period. Drawn to these areas were many former British subjects who had responded to the immigration schemes of the West Australian Government. The close proximity of Hamilton Hill attracted many newcomers who recognised the potential of the land. 1911 saw the first of a new wave of migrants to these localities, people from Southern Europe, mostly of Slavic descent. The settlement of the Slav people was important as they were the last major group to take up land in the area. The returned servicemen, united by their common overseas experience, set up a chapter of the Returned Servicemen’s League in 1919. They worked together to build memorials and halls in remembrance of fallen colleagues. In 1925 Hamilton Hill’s Memorial Hall was constructed on a prominent position on a site once used for lime kilns. Hamilton Hill received electrified street lights in 1925 but domestic power did not come until 1926. The subdivision of parts of the Manning Estate in Hamilton Hill into residential lots occurred in 1924. This movement towards smaller blocks allowed the growth of the commercial centre on Rockingham Road around the Newmarket Hotel. Produce stores in the Hamilton Hill Commercial Centre provided services for locals as well as for people as far out as Bibra Lake and Jandakot. John Greenslade ran one of these stores successfully for many years. The period after World War I was one of dynamic change. With technological developments, expanding areas under rural production (with the decline in others), increasing light industry and the introduction of residential areas, Cockburn was looking to a bright future. This future was tarnished bythe sudden arrival of the Depression in 1929. Severely decreased demand for goods meant a cessation of any expansion. Recovery from the Depression was slow and many people believe World War II was a main contributing factor to the return of growth to the economy. The most significant event immediately following World War II was the influx of European migrants which included many from Italy and Yugoslavia. Their input contributed to an increase of the area under market garden production, but nevertheless they could not stem the changing pattern away from market gardens and vineyards to a suburban style of living in Hamilton Hill. The then State Housing Commission was involved in many projects in the area including the development the Southwell Estate. The increase in population led to a larger revenue and greater recognition for Cockburn. Thus in 1955 Cockburn gained the right to its own Roads Board. The Cockburn Districts Roads Board promised to increase amenities and roads under its jurisdiction. One outcome was the development of the Davilak Reserve in Hamilton Hill as a playing field to supply recreation facilities for its expanding population. Where previously high school students from Hamilton Hill, Coolbellup, Spearwood and South Coogee had to travel to Fremantle for an upper school education, they could now attend Hamilton High School, built in 1962. In 1976 the Cockburn Historical Society was formed and in 1982 the Azelia Ley Homestead, was classified by the National Trust. The Cockburn Council appointed the Historical Society as custodians. Since the 1960s Hamilton Hill has continued to urbanise as small to medium market garden lots were subdivided into residential lots usually ranging in size from 750sqm to 1400sqm. The mostly single residential houses constructed on these lots reflected the tastes and the budgets of the time in which they were constructed. As such Hamilton Hill now contains a great mixture of housing stock constructed from the 1920s to present day.